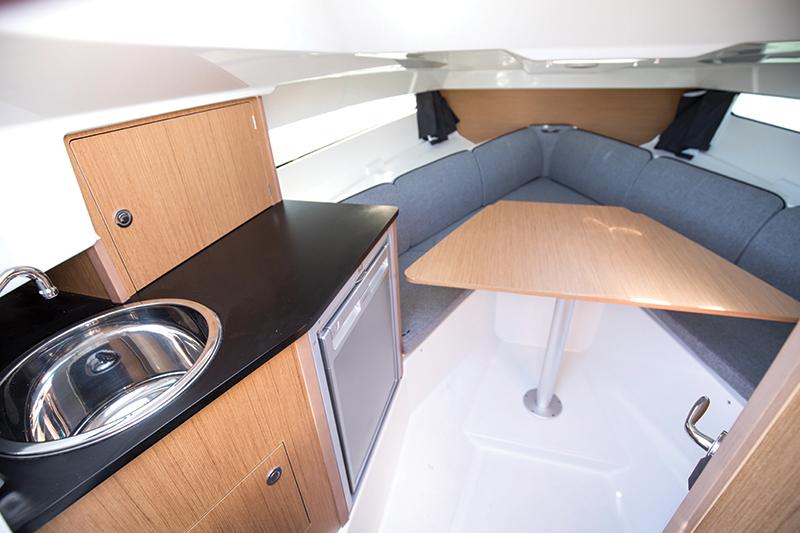 A new dayboat from Beneteau promises all-day activity for many people and all-night comfort for two. Anyone who still sees Beneteau (beneteau.com/us) as a European sailboat builder is falling behind the times. 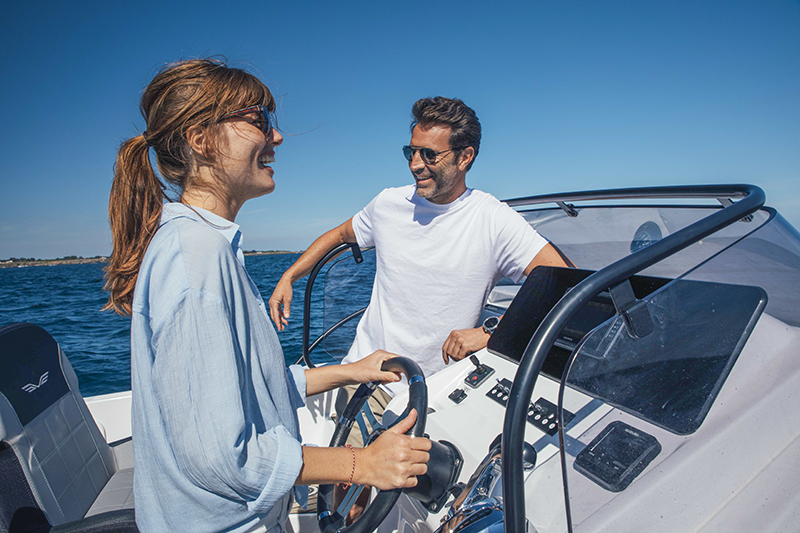 Power has been part of the French boatbuilder’s DNA since the beginning, and some of its boats are now built in the U.S. 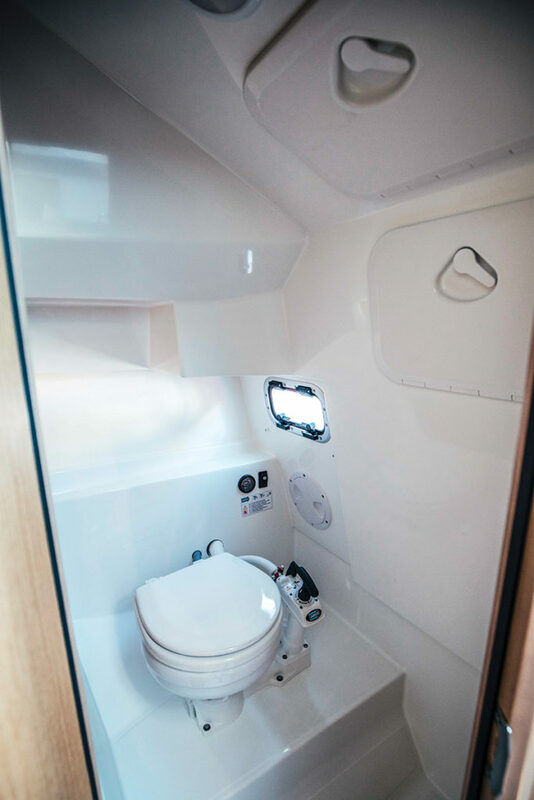 The latest line to cross the Atlantic Ocean is called Flyer, and the Flyer 23 SUNdeck is the latest iteration, introduced at the Miami International Boat Show in February; the 23 SPACEdeck will follow. 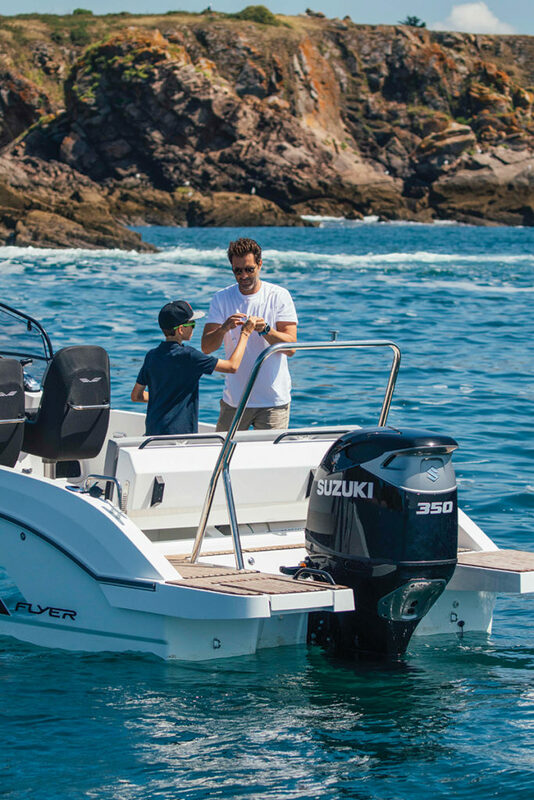 At 26 feet, 7 inches LOA and with an 8-foot, 2-inch beam, the Flyer 23 SUNdeck is definitely trailerable. 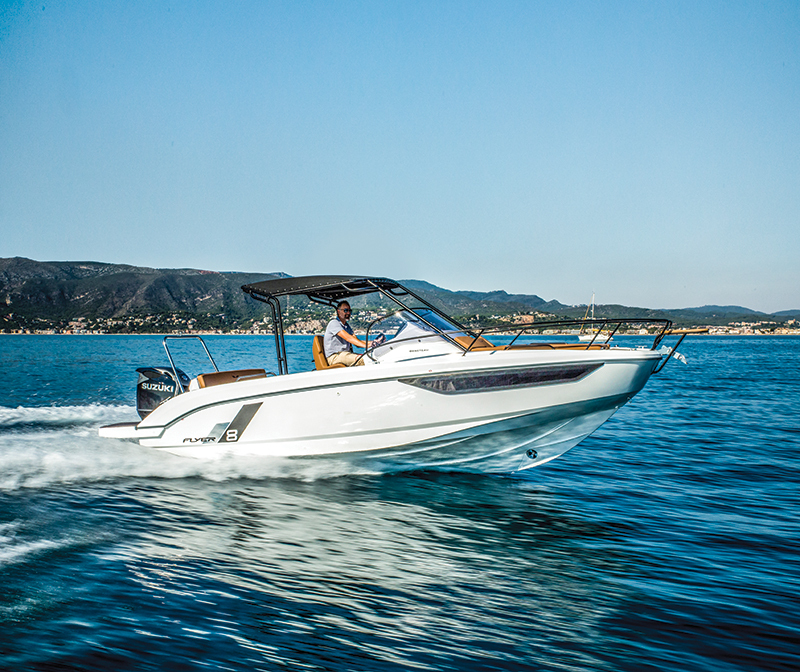 A single 300 or 350 hp outboard points to speed — it tops out at about 46 mph with a Mercury Verado 300 — but its amenities point to dayboating for a group or weekending for a couple. A ski tow brings watersports into the picture. 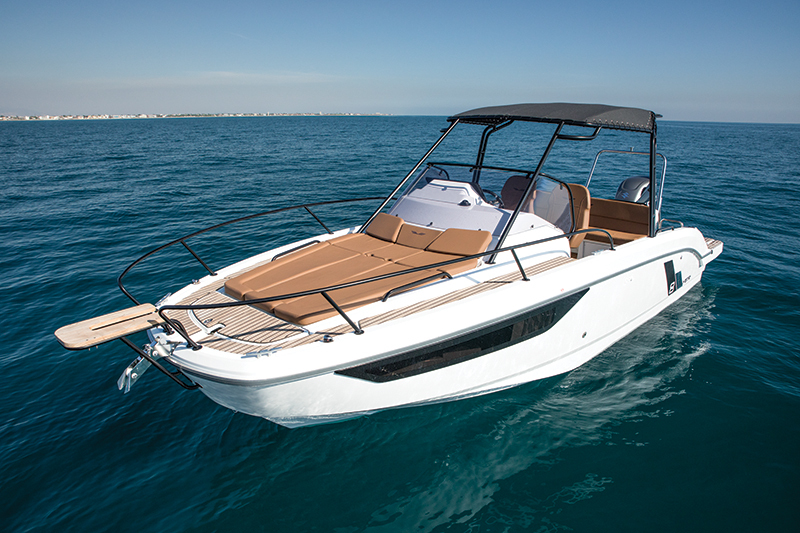 Two or three people can share the bow sunpad on the Flyer 23 SUNdeck, two more can occupy the helm seat — a Garmin electronics pack makes navigation easy — and three more can sit on the transom bench seat, which converts into a second sun lounge. While the outboard bisects the swim platform, both sides extend around the engine, and a covered telescoping ladder extends from the port platform for reboarding purposes after a dip or a ski run. Lacking a cabin but promising to be a versatile multipurpose boat with more fishing amenities, SPACEdeck features a center console, a T-top and the option to replace the transom bench with a fishing station that includes a counter, a baitwell, rod holders and more.